I LOVE that your whole family jumped over the turnstyles! Awesome. I’m betting that is one of the biggest memories the kids will have, and their friends will be most impressed about! My sisters & I took the tube in London, I can’t remember what our malfunction was but the map was like an ancient foreign cartographers map, it took some doing. 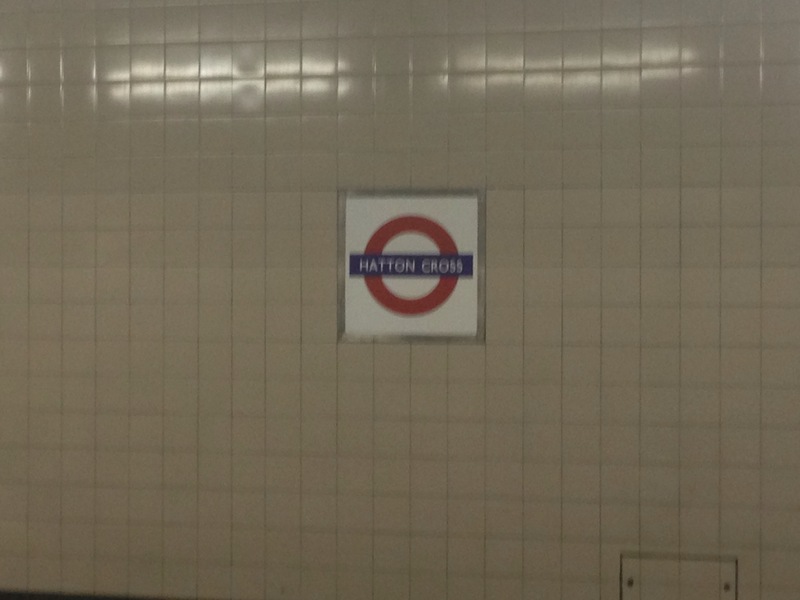 It didn’t help that we were drinking and shouting “Mind the gap!” at each other non-stop. That station pictured is SO CLEAN!!! Looks like a fantastic trip. Thanks for sharing! Haha! Nice work you scoundrels! I was just in Paris and that damn credit card chip thing is so annoying! Come on America! Get it together! I had some weird issue too, where I bought a ticket and it wouldn’t always scan. 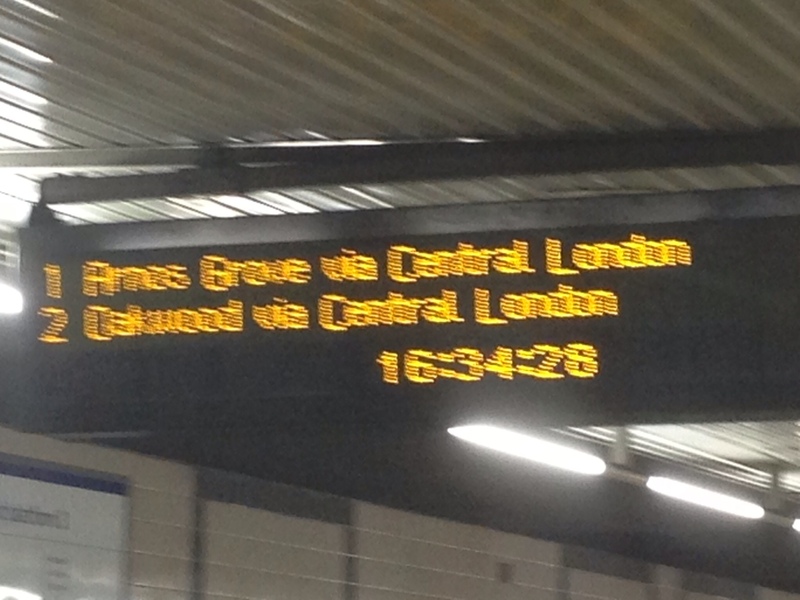 I could get on the train sometimes and then other times big red beeps. 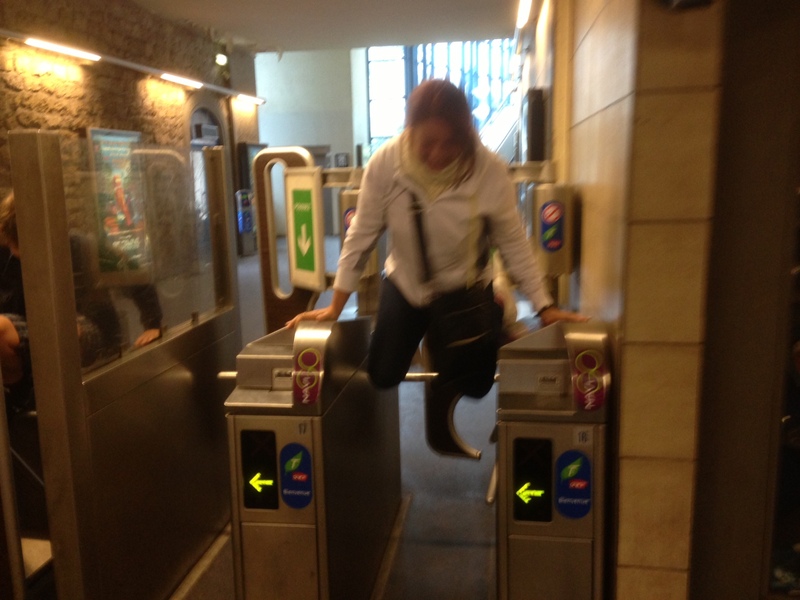 One time, I got on fine and then when trying to get off it wouldn’t work and I got stuck between the gates. Like a 2 foot space. Oh ya, and I was carrying my huge bag. I panicked and a french guy kicked me. It was rude but it broke the gate and I made it! Luckily that was our last day. We lived in England for 3.5 years and our lack of pin & chip cards was so frustrating. Before any transaction, we’d have to ask if they took swipe cards (usually did, but lots of machines didn’t, as you know!). 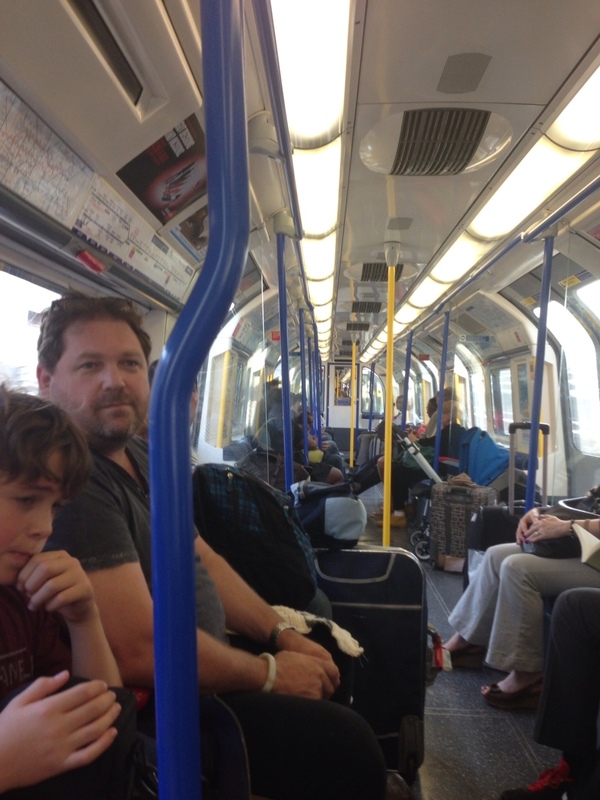 I loved the tube in London; I felt so grownup taking it. The closest thing my hometown of Portland, OR has is the Max, which is probably similar to Edinburgh. I do love public transport! For the Number One country in the world America is still so behind in so many areas. I guess it’s just not really number 1. Oh my god! I would have been SO nervous about doing that!!! I’m so glad you didn’t get tossed in a French prison with no salon! I must say the Italian Tren Italia was like First Class on the Amtrak. Although we did get on the wrong train in Naples and almost ended up in Sorrento instead of Pompeii. DC’s subway is a dream – even I can’t get lost there! I’m hoping to try my hand at the NY subway soon. I may need your help! Sure! Can’t wait, as for being locked up? We would have talked our way out of it. AND we were willing to pay for the tickets we couldn’t purchase. My daughter would have never jumped the turnstile. She’s like a crazy rule follower. I have no idea where she picked up that annoying trait. She’s also the only one in the family that can read subway maps. I give and receive directions based on fast food landmarks so I’m totally lost in Europe. It sounds like y’all made a lasting memory. I have never been on a subway – even in the US. I did take the L in Chicago once – does that count? Thanks for having me as a co-host:) Glad to see you didn’t get arrested too! I have no idea if it’s the same as the L train, never been on that. As for co hosting, so glad you did! You’ve popped your hosting cherry! I’ve been on the NYC subway many times. What I remember most is the *rush* and the smell. Not that there was always an offensive odor (although it happens!) but there is a distinct smell to the subway system in general. I wonder if it’s a common thread? Never been on another city’s system so I don’t know. Great post and photos! Enjoyed it! It’s a totally crazy experience every time we travel on it… and that’s alot. There’s always a strange character somewhere in the system. Hmmmm. You leave your fellow New Yorkers with a few points to ponder here. 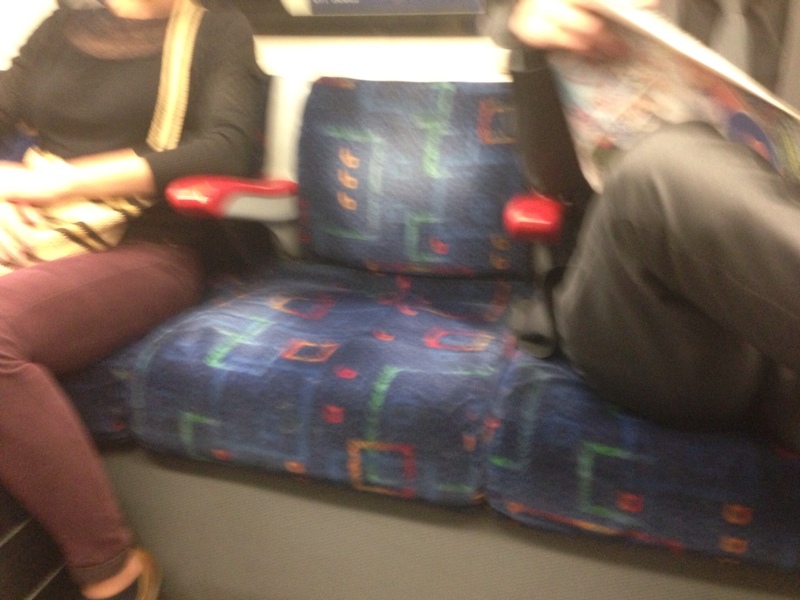 Your pictures of the European tube/train look exceptionally well-groomed. There is something about keeping company with rats that makes me feel like I need to take a second look at my life. Should I venture out to Edinburgh? Paris? It all looks so enticing! It’s pretty cool, you should go! But the subway here is still cheap by comparison around the world. Well one day he just might get that opportunity!